The reasons for sharing this recipe is three-fold. 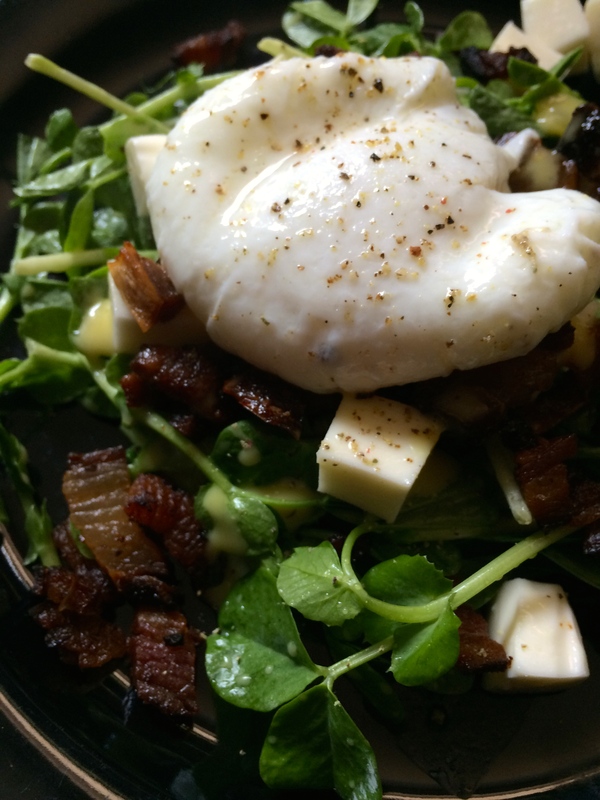 Firstly, I realized I haven’t done nearly enough breakfast recipes. 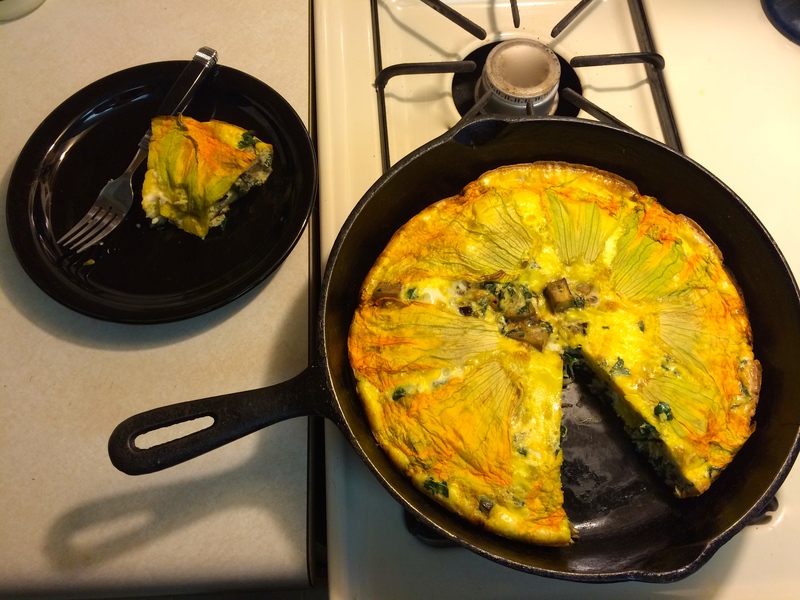 The last one that I wrote about was also a frittata, but the recipe was from Valerie of The Culinary Nomad and I wanted to create one of my own. I was inspired by my roommate, who, in an effort to use as many “leftover” produce items in our fridge, threw together a delicious breakfast treat. 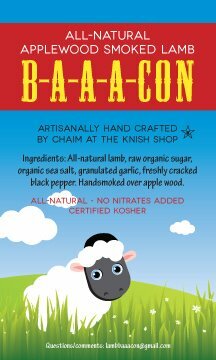 Another reason I wanted to make this recipe is because it works so well for the upcoming Jewish holiday, Yom Kippur. Traditionally, those observing the holiday fast for 25 hours. The end of the fast is marked with a “break fast” and, in true Jewish form, is usually quite a feast. This dish is a fabulous addition to a break fast, as it is pareve (neither dairy nor meat), which means it is perfect for any kosher (or non-kosher) get-together. It also makes a great vegetarian dish. The final reason for this recipe – squash blossoms! They are so beautiful and quite abundant this time of year, but so few people actually know how to use them. 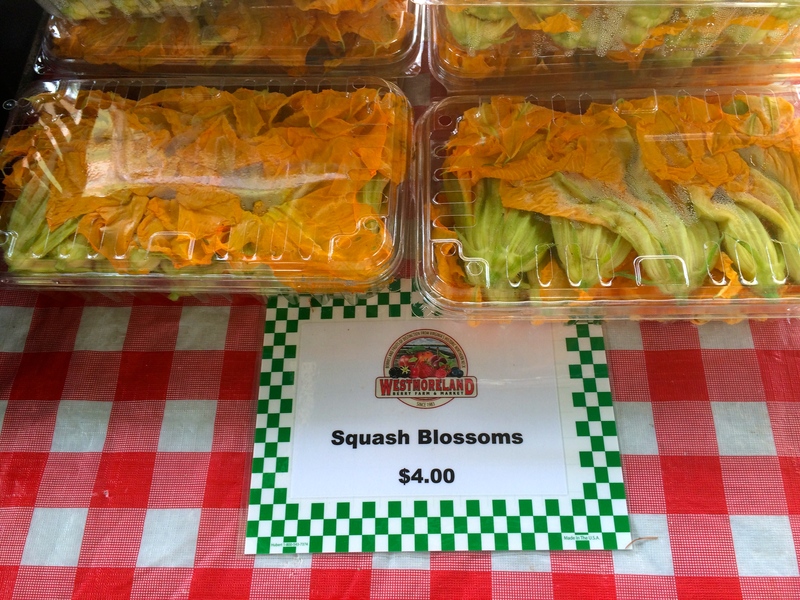 Squash blossoms are the edible flowers from the squash plant. They come in varying shades of green and orange and are so much more than just a garnish. Typical squash blossom applications include filling them with cheese or dips and frying or baking them, tossing them into a pasta dish, or adding them in soup. They don’t have many calories, and are high in Vitamins A and C, so they are so much more than just gorgeous decorations! This recipe takes some seasonal ingredients and puts them together into a “could-not-be-simpler” frittata. One of the greatest things about frittatas is that they are so versatile. My roommate helped me discover that as long as you have farm-fresh eggs and fresh produce from the market, you can make numerous varieties of frittatas. The best part is, they make great leftovers – a single portion heats up perfectly in the microwave. 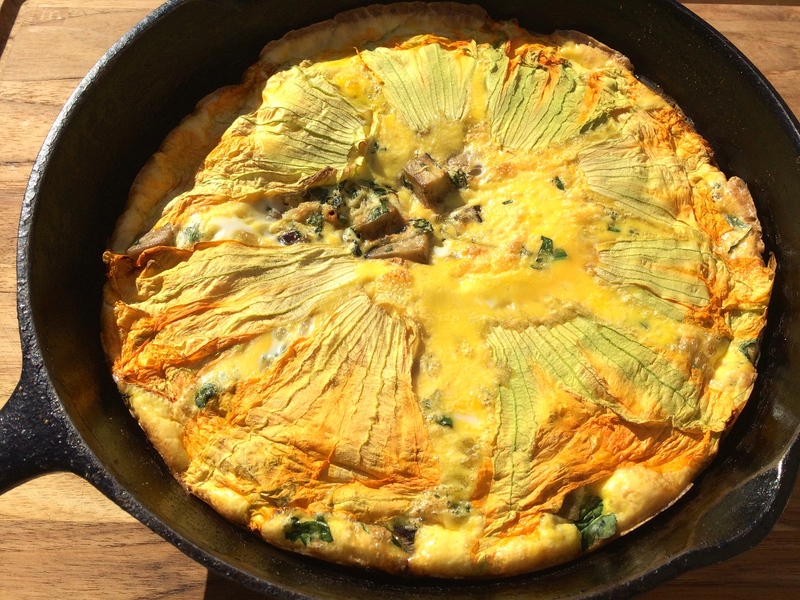 A good friend of mine comes to the market every weekend, buys eggs and whatever produce/cheese/meat strikes her fancy, goes home and makes a frittata that serves as her breakfast all week long! Preheat the oven to 400. Lightly beat the eggs in a large bowl, and add salt and pepper to taste. Medium dice the eggplant. Remove the ribs and chop the kale. Mince the garlic (or use a zester) and add to bowl with eggs. Thinly slice the shallot. (The squash blossoms look a lot more intimidating than they actually are). Remove the round bottom, making sure to take the stamen and any spiky leaves surrounding the stamen with it. In a cast iron skillet (or at the very least, an oven safe pan), heat the oil. Toss in the shallots and cook until they become translucent, about 3 minutes. Add the eggplant and do the same, about 4 minutes. Throw the chopped kale in there and cook another 1-2 minutes. Make sure to add salt and pepper to taste. 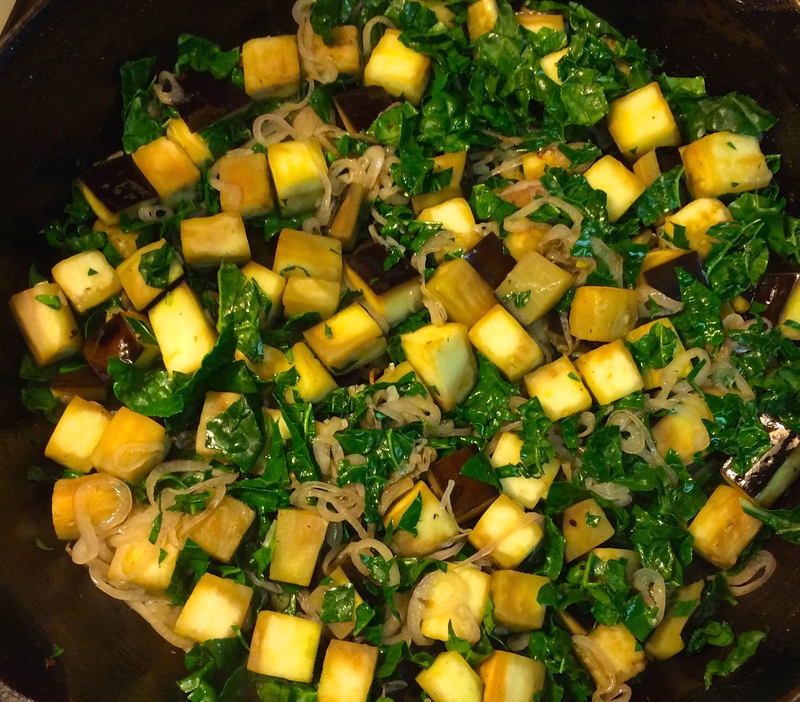 Press the veggie mixture down with a spatula, making sure to create an even layer around the pan. Pour the egg/garlic mixture on top. Place the squash blossoms in a layer around the top (depending on the size of the pan and the blossoms, you’ll know how many you need). Keep the pan on the stove 5-7 minutes, until you just start to see the frittata set. Place in the oven 10-15 minutes until there is no “jiggle when you wiggle.” Allow the frittata to cool at least 5 minutes before serving. Enjoy! It’s been a while since I’ve done a recipe with beef in it. 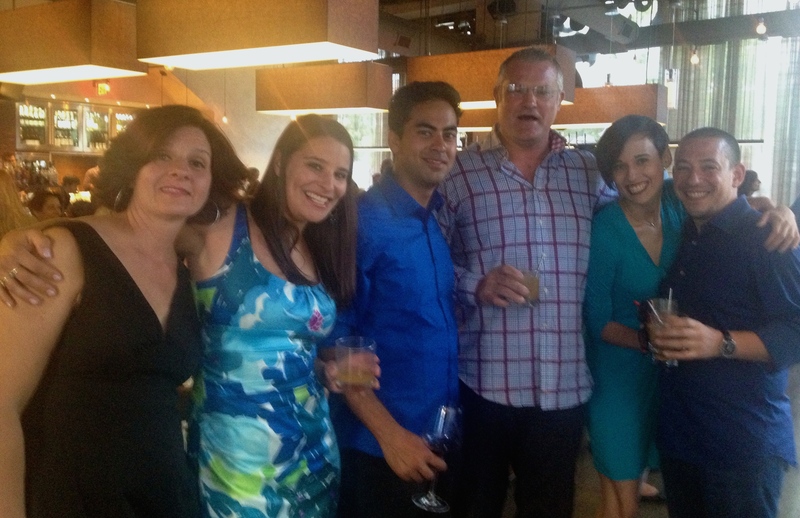 I think the last one must have been the Short Ribs back in May. Beef from any vendor at the Central Farm Markets is high quality, fresh and delicious. 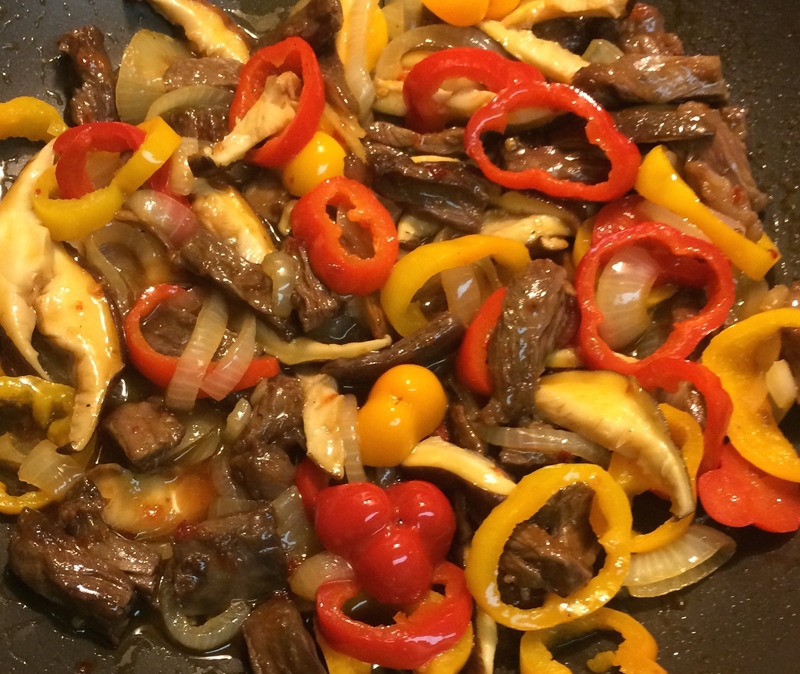 I got the beef for this recipe from Shane at Liberty Delight Farms. I love using Shane’s product. Having been to the farm twice (once for a general tour, the other to write about his bunny operation), I have a particular partiality to what he represents. I’ve loved seeing him in the thick of things, caring for his animals personally and treating them with the utmost attentiveness, as if he himself is going to be eating the final product. It is that kind of care and attention to detail that makes Liberty Delight Farm such a special vendor for us to have at all three markets. 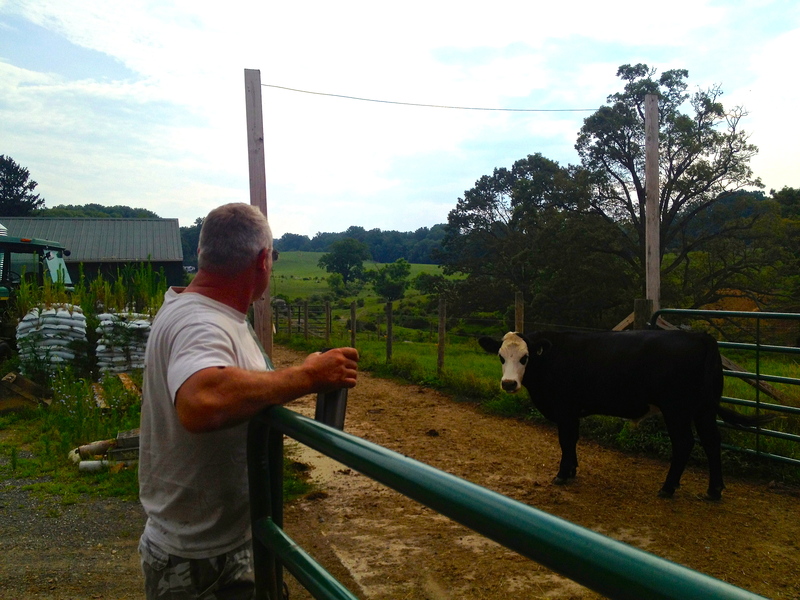 It’s one reason why we love getting to know our farmers, too! I have spoken before about Nicole at Two Acre Farm. She creates such amazing concoctions with the produce on her little farm- delicious salsa, dressings, and jams. 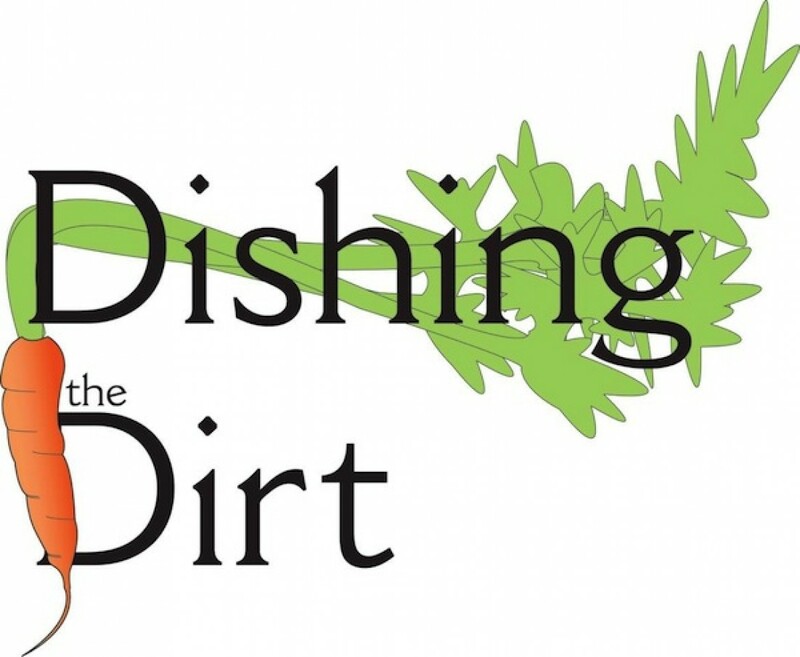 I’m also looking for a way to use one of her unique products in my dishes. When I told her I was planning to do a beef stir fry, she rushed me over to her sauce-tasting tray and told me “you need to use this Vietnamese sauce.” One taste and I knew that this was exactly what I needed for this dish. Its got the perfect amount of sweet and spicy- leaning a little more to the spicy side allows me to use a sweet onions and peppers to balance everything out. I highly recommend you stop by her table to try some of the delicious creations that she spends her week slaving over. She’s also got some delightful little sweet peppers that are great for all kinds of recipes and more importantly, for snacking! It’s also been a while since I’ve had mushrooms in any of my recipes. I’m not sure why, but I tend to equate mushrooms with fall and winter recipes, though they are available all year. They also aren’t historically my favorite things to eat, but I’m learning. 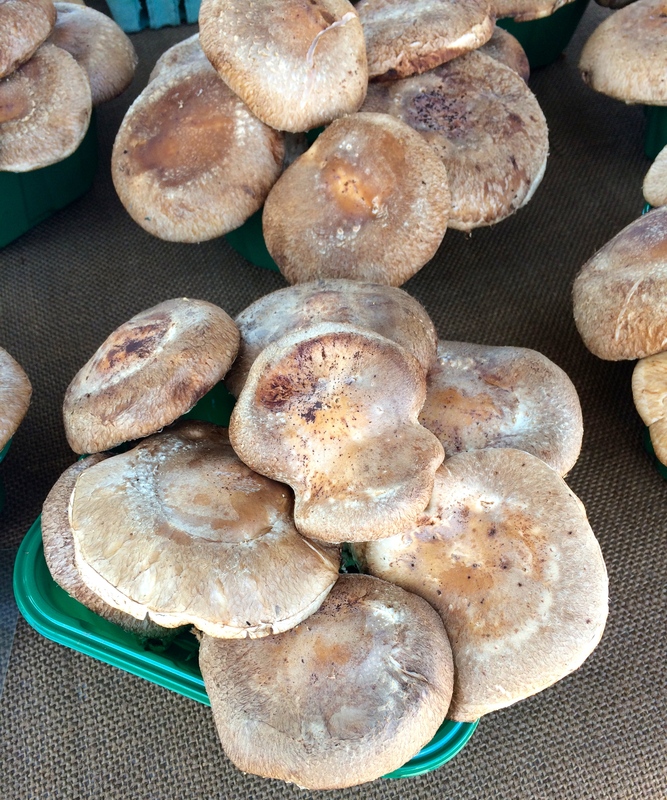 Having the Mushroom Stand at the markets has been a very great learning opportunity for me- I never knew how many varieties of mushrooms could possibly be available to us! I explored the benefits of shiitake mushrooms in a previous recipe last year, and since then I’ve really enjoyed using them as much as possible. 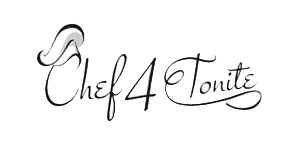 The shiitake in this recipe add a nice nutty flavor to the dish. Enjoy this dish with a nice piece of crusty bread from the market or on top of some basmati rice. Serves 4-6, depending on portion size. Marinade the beef for at least 6 hours the Vietnamese sauce, set aside 3 Tbsp. for future use. Peal, halve, and cut the onion into strips about ¼ inch thick. Wash and core the sweet peppers. Cut into disks about ¼ inch thick. Cut stems off the mushrooms and clean the tops with a dry paper towel. 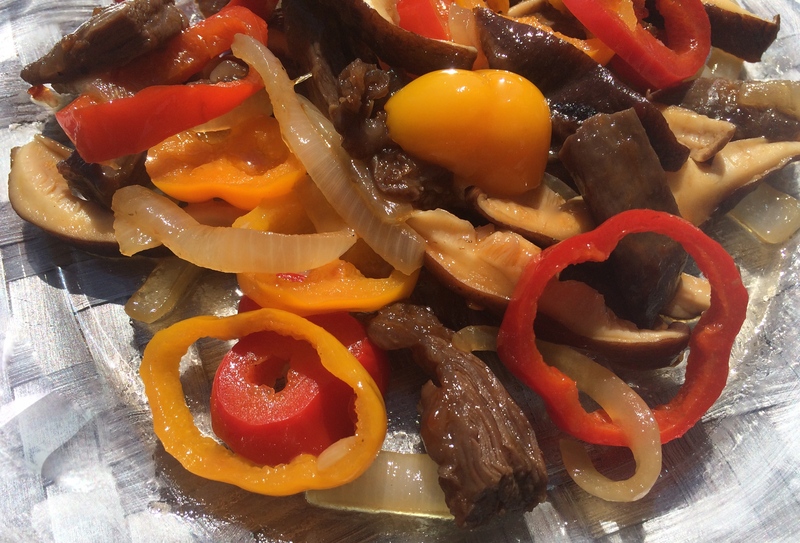 Cut the mushrooms into strips about ¼ inch thick. Thinly slice the garlic. Mince the jalapeno, if using. Slice the skirt steak into strips about ½ inch long then cut them in half. Add 3 Tbsp. oil to a large pan. When the oil is hot, add the garlic, onions, and peppers. Cook for 4-6 minutes, until the onions become translucent. Add the remaining 3 Tbsp Vietnamese sauce to 1/8 cup of water and add that to the pan (add the minced jalapeno, if using). Coat the veggies evenly with the liquid. Stir continuously until the liquid has almost completely evaporated. Add the mushrooms and cook for another 5 minutes. Remove veggies from the pan, salt and pepper to taste. One of my favorite things to do at the market is just walk around and look for foods that are new or interesting to me. For some reason, in the past few weeks there have been quite a few items that fall into that category! I decided it was my duty as Market Blogger to introduce you to these items and give you a little bit of information regarding what exactly they are, what they taste like, and what you can do with them. First on our plate is the Pluot. The variety I found at Toigo Orchards is a yellowish-green, sometimes referred to as “Empire”. 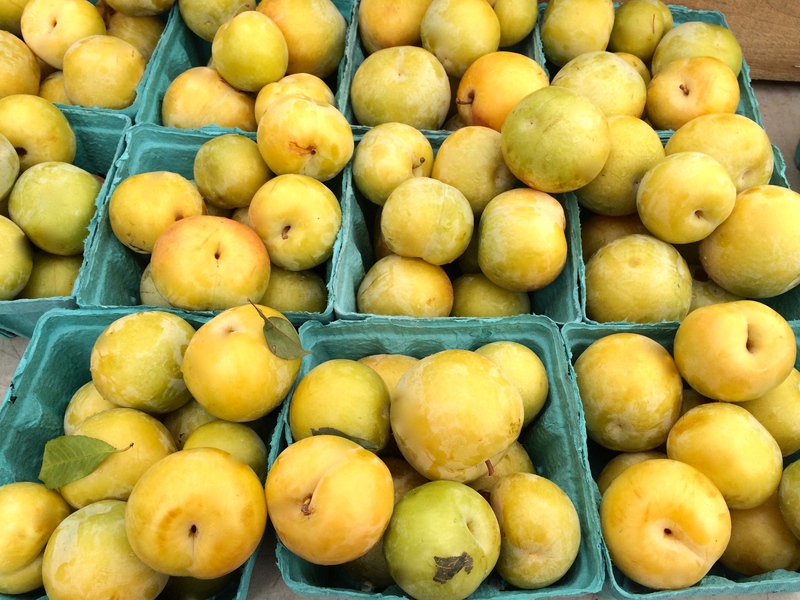 Pluots, or “plumcots” as they are sometimes called, are a distant hybrid between plums and apricots. Their lineage is generally thought of as ¼ apricot and ¾ plum. The skin is delicious, a little tart as you would expect from a plum, but light and easily eaten- no need to peel. In my opinion, the best way to eat these sweet treats is whole and raw, with a paper towel for the juice. However, I wouldn’t be opposed to trying them in place of plums in a Plum Tart recipe. If you choose to bake with them, make sure you get pluots that aren’t too ripe – you’ll want that tart flavor and hardy texture for the tart. The next interesting item is the tomatillo, which found at Westmoreland Produce. Out of all of the things I chose to write about, I would venture to say that the tomatillo is the most well-known. However, I’d bet that most people don’t have a clue what to do with them – or even what they really are! 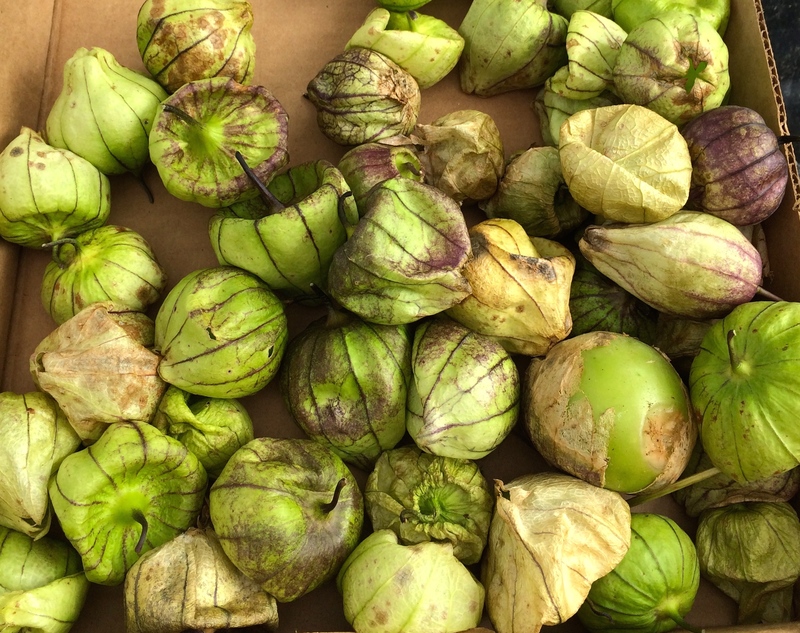 The tomatillo is typically thought of as a Mexican delicacy, but we are lucky enough to have some locally-grown ones available to us right here in the DC area. Also known as the “husk tomato” or “ground cherry,” tomatillos are actually a different species than tomatoes. When you buy them, they are surrounded by an inedible paper that begins to split as the fruit ripens. Ever since I visited Mexico years ago, my favorite application for tomatillos is probably the most traditional: salsa verde. The tart flavor they have is perfect when cooked and added to a mixture of hot chilies, cilantro, and onions. I’ve used the next item in a recipe already this summer (Ratatouille Tart) and I was so impressed with its beautiful exterior and delicious interior, that I have been getting them at the market ever since. They are called “Costata Romanesco Squash,” and they have very quickly become a staple in my kitchen. 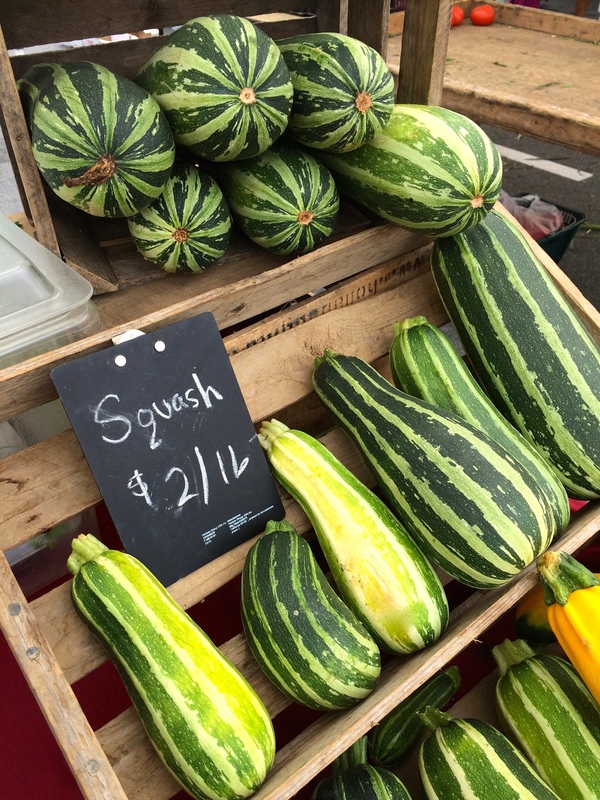 This variety of squash is considered an heirloom variety, which essentially means a breed or species of fruit or vegetable that is not commonly associated with large-scale commercial production and whose seeds may have been handed down for generations. The costata romanesco is extremely juicy and has a beautifully nutty taste that I find irresistible. Rob at Young Harvests grows very large ones, some big enough to feed a whole family! My recommendation is to cut them pretty thick (about ½ inch disks), coat them in olive oil, sprinkle some salt and pepper on them, place them on a cookie sheet. I broil in the oven until they just start to get brown. They are best when eaten hot, but easy to reheat. In fact, I might go heat up some leftovers from dinner last night…. The Canary Melon is next on the list. Found at the Twin Springs Fruit Farm stand, I alluded to it in my melon mania post last week, but now its time to really find out what they are. When you cut open a canary melon, it will look very much like the inside of a cantaloupe. There are, of course, a few subtle differences; the flesh color is a light yellow, the skin is surprisingly thicker, and the smell is not the overpowering melon-like smell you expect from a cantaloupe or honeydew melon. Some people have actually referred to the taste as “pear-like, ” but in my opinion, the canary melon has a slightly tarter bite than other sweet melons and certainly sweet pears. 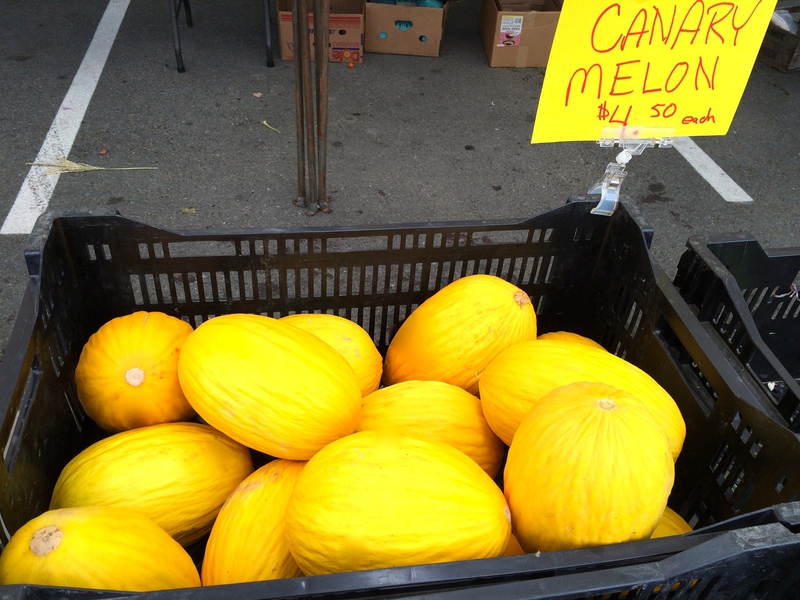 Canary melons are great when eaten as is, but a fun way to jazz it up would be chopping up some cilantro and tossing it with some olive oil and the melon. 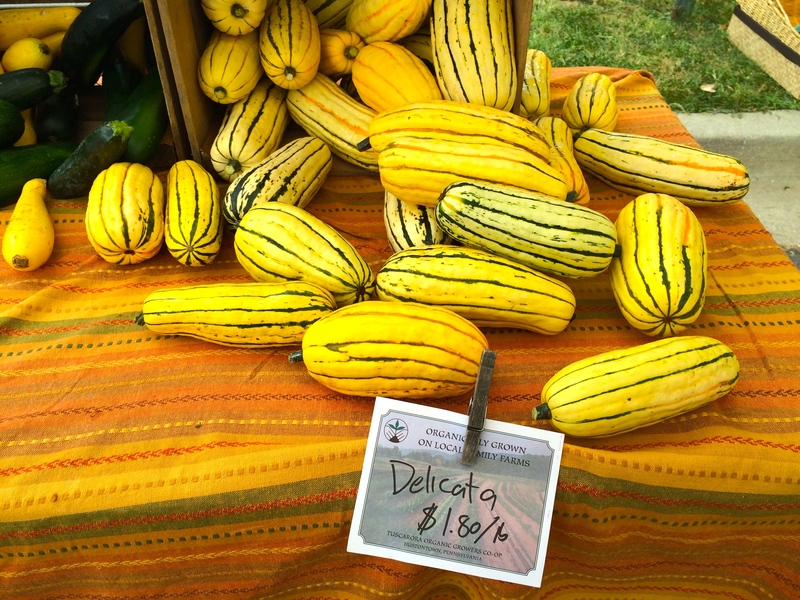 The final item I want to talk about is the beautiful Delicata squash. Typically known as a winter squash, they just started showing up at the Bending Bridge Farm stand. Cream or yellow colored with green stripes, they make a gorgeous statement even without their culinary value. As the name suggests, they are a delicate item, the skin being very thin in the early months of harvesting. As the season goes on, and the squashes mature, they do tend to get a bit hardier. Another great thing about the early-season delicates- you can eat the skin! (The skin of fruits and vegetables always provide quite a bit more nutritional value than the flesh alone). The easiest – and in my opinion, most delicious – way to prepare a delicata squash is by roasting it. Cut it in half, remove the seeds (these can be toasted in much the same fashion as pumpkin seeds), and slice the halves into ½ inch pieces. Rub the pieces with olive oil, salt and pepper to taste, and roast in a single layer on a sheet pan in the oven for about 10 minutes. Flip each piece over and roast 7-10 minutes more, until brown. The taste is a cross between nuts and popcorn. Delicious! 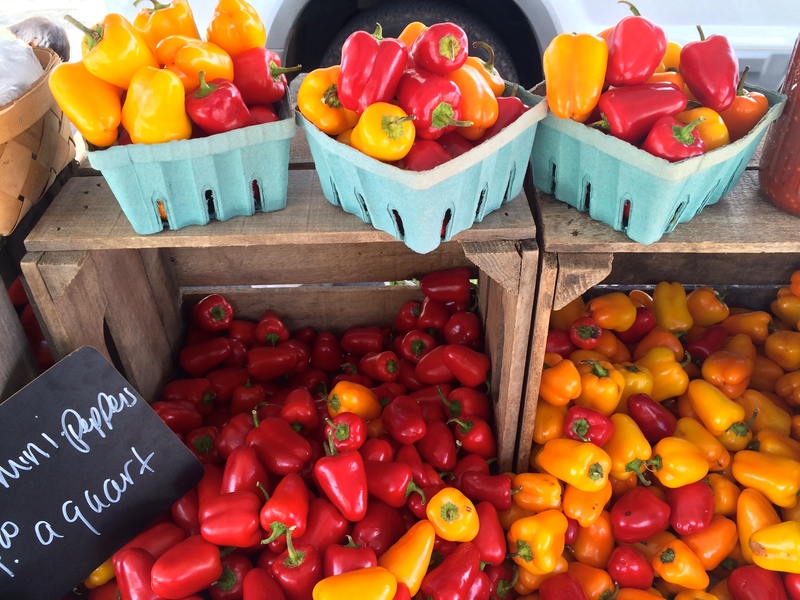 This gives you and idea of what a thrill it is to try new and usual items at the farm market. Try these out and spend some time walking around the market, looking for fruits and veggies that you may not have eaten before. I guarantee you that our vendors at all three markets can give you quite a bit of information about all of the produce they are selling. Try new things! 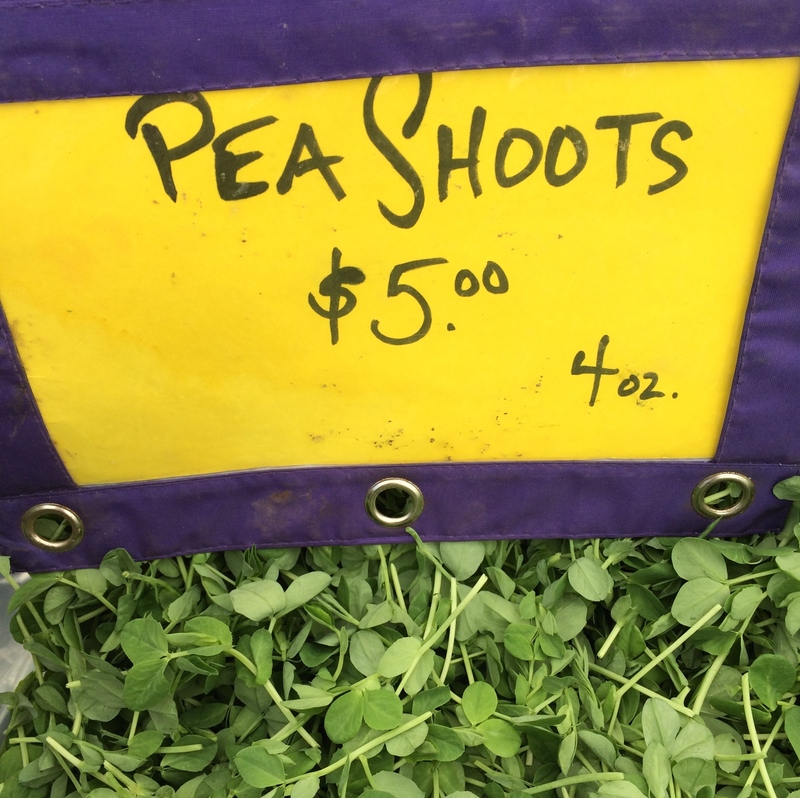 You really never know what will soon become a staple on your farm market grocery list and on your table.